Members of the House of Commons who supported the six points of the Charter, such as Thomas Attwood, Thomas Wakely, Thomas Duncombe, John Fielden and Joseph Hume constantly emphasised the need to use moral rather than physical force. Leaders of the Moral Force Chartists believed that peaceful methods of persuasion such as the holding of public meetings, the publication of newspapers and pamphlets and the presentation of petitions to the House of Commons would finally convince those in power to change the parliamentary system. 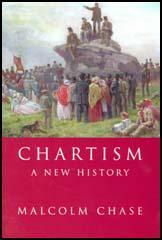 The first Chartist petition was presented to the House of Commons on 7th May, 1839 by Thomas Attwood, John Fielden and Joseph Hume. Although the petition contained over 1,280,000 names, when the debate on the motion that the petitioners be heard in the House of Commons took place on 12th July 1839, it was rejected by 235 votes to 46. In May 1842 Thomas Duncombe introduced a second petition of over 3,250,000 names to the House of Commons. As well as demanding the six points of the Charter the document also complained about the "cruel wars against liberty"; and "unconstitutional police force"; the 1834 Poor Law; factory conditions and church taxes on Nonconfotmists. It also included an attack on Queen Victoria, contrasting her income of "£164 17s. 10d. a day" with that of "the producing millions". The House of Commons decided by 287 votes to 47 not to accept the petition. The third petition was organised by Feargus O'Connor, the leader of the Physical Force Chartists. At the meeting held at Kennington Common on 10th April 1848, O'Connor told the crowd that the petition contained 5,706,000 signatures. However, when it was examined by MPs it contained only 1,975,496 names and many of these, such as, those of well known opponents of parliamentary reform, Queen Victoria, Sir Robert Peel and the Duke of Wellington, were clear forgeries. It is a very remarkable fact connected with the later Chartist Petition that the parties who appear to have contributed the largest amount of signatures were not forthcoming to back the document on the day of its presentation. Had the petition been anything but a hoax, Her Majesty would have been at an early hour wending her way towards Kennington Common with seventeen Dukes of wellington at her side, and Sir Robert Peel would have been conspicious in the van that was bearing the monster document. 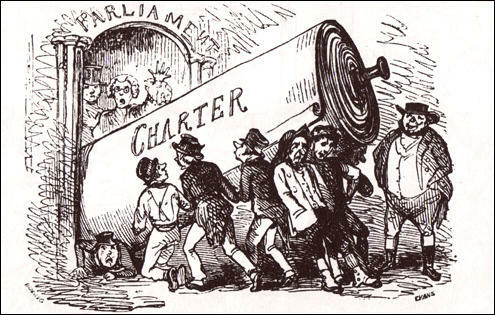 At least of the points of the Charter - the payment of Members - Lord John Russell and Sir Robert Peel would, at least, have some prospect of earning the money, while the Chartist heroes, if they did happen to get smuggled into Parliament, would so disgust their own constituents that the salaries would soon be stopped to such worthless representatives. 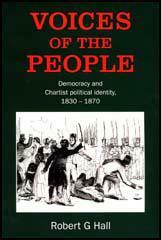 (3) House of Commons report on the Chartist Petition of 1848. The number of signatures has been ascertained to the 1,975,496. It is further evident to you Committee, that on numerous consecutive sheets the signatures are in one and the same handwriting. Your Committee also observed the names of distinguished individuals. Among which occurs the name of Her Majesty, Duke of Wellington, Sir Robert Peel, etc. etc. Your Committee have also observed the insertion of numbers of names which are obviously fictitious, such as 'No Cheese', 'Pug Nose', 'Flat Nose'.